Families should know the potential risks, get support, and expand their faith. As Brandon M. Ogden (BA ’00) and Jenny Watson Ogden (BS ’96) raise four young children in Gilbert, Ariz., their third child’s special needs have the potential to eclipse the needs of the other three, which could contribute to resentment and alienation. Instead, 8-year-old Austin’s limitations and peculiarities—and also his loving disposition—are m ostly a blessing to his siblings. “We have taught our kids from day one that Austin’s syndrome does not define who he is. He is first a child of God, an individual, and their brother. We often discuss why God made him this way, and why He sent him to our family. Our kids comment that even though Austin has issues that are difficult to deal with, Austin brings a lot of love and happiness into our family,” says Jenny. All families who have a child or children with special needs struggle for balance. Whether their child has autism, cerebral palsy, or diabetes, most parents can quote the incidence rates per 100 children, list symptoms, talk about causes, and explain treatments. Some, however, are not versed in the potential risks to siblings of a child with special needs and the protective factors that can help all their children thrive in the face of tremendous challenges. For several decades, professors Susanne Olsen Roper (BS ’75) and Tina Taylor Dyches (BS ’86), and their colleagues Barbara L. Mandleco (PhD ’91) (College of Nursing) and Elaine Marshall (Georgia Southern University), have been studying families that include a child or children with special needs. While their studies show that these families generally do quite well, and, in fact, may benefit in some ways from having a child with special needs, they say parents can minimize the downsides by understanding the risks, getting support, and drawing on their faith. The Ogdens work at preventing resentment by expecting Austin to at least try to do what’s expected of his siblings, such as chores, schoolwork, and practicing good manners. These are not easy tasks for an 8-year-old with Williams syndrome, a genetic condition characterized by a wide range of physical and intellectual difficulties. “When our kids see that Austin also has to make his bed, treat others kindly, not yell, and follow the rules in the house, they don’t have those negative feelings towards him,” says Brandon. As the children observe Austin struggling to do his best, it’s easier for them to accept his limitations. 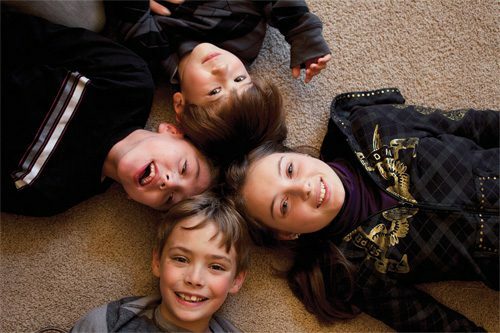 Siblings may also be at higher risk for being bullied, perhaps as they try to protect their brother or sister from tormenters. While they might become physical guardians, they also can feel pressure to overachieve academically. “If you have a child who is not functioning normally intellectually, the sibling often feels like he or she has to overcompensate—‘I’ve got to get straight As and be the top violinist so I even things out,’” says Dyches, an associate professor of special education. Parents should be alert to these behaviors and reassure their children that they accept them as they are, she says. One of the most powerful protective factors in all these risks is ongoing conversation. If parents explain a child’s special needs to the family when a diagnosis is first made but then don’t bring it up again, their children can be at greater risk. Rather, parents should cultivate an open relationship where their typically developing children feel comfortable disclosing thoughts and feelings, no matter how distressing. The Ogdens nurture this gestalt daily. As every parent of a child with special needs knows, finding help can be daunting. The more significant the disability, the harder it can be for families. A typical 13-year-old babysitter would not be able to handle, for example, a nonverbal 4-year-old with autism who has self-destructive behaviors. “So parents say, ‘I can’t trust anyone with my child or children to do the job that I can do, so I’ll just do it all myself,’” says Dyches. Giving up on the search means that parents don’t get a break, which in turn means they may be less available both physically and emotionally to each other and to their other children. Dyches and Roper urge parents to persist in looking for support until they find it. While state programs for respite care can have long waiting lists, parents should get on the lists. They also can enlist adult sitters, hire two sitters at a time, trade time off with other parents of children with special needs, and take advantage of special programs. In Utah County, for example, parents who do not get state assistance or are on a waiting list can bring their child with special needs to Friday’s Kids Respite, www.fridayskids.org, where competent adults, often BYU student volunteers accompanied by a nurse and other professionals, provide free childcare for an evening. Parents can also enroll their children in the Sibling Support Project, a workshop that helps normalize the experience of having a sibling with a special need (siblingsupport.org). The monthly “Sibshops” are held in 340 locations throughout the world. “It’s a fun, engaging two or three hours where these kids can feel like they’re not alone. They can talk to other kids who are likely to relate to their experiences when they say, ‘Yeah, my brother has seizures, too’ or ‘Once my brother was life-flighted to the hospital.’ They can talk about these experiences that have really affected their lives in a friendly, easy-to-communicate environment,” says Dyches, co-founder of Sibshops of Utah County. At different times, the Ogdens’ support system for Austin has included a behavior coach, physical therapist, occupational therapist, speech therapist, music therapist, and respite providers. The support team also includes his schoolteacher and aides. Of great help has been joining the Williams Syndrome Association in their area. “We share ideas that help us solve some of our problems and we laugh about the funny things our children have in common. We support each other. It also helps to know that someone else knows what you are going through and how you feel when things get rough,” says Brandon. In the Ogdens’ case, Austin’s syndrome includes high social abilities, making him easier to enjoy and be around. For families whose child with special needs means decreased social abilities, staying attached and bonded—and sympathetic—can be much more challenging. A delinquent child may be passing down more than just used clothes to younger siblings. When the Dinnells' third son was born with DeBarsy Syndrome, they discovered new ways in which to serve. BYU researchers offer support on raising children with disabilities.